The Magna Carta display in the Crypt of the United States Capitol features a replica of the English document whose principles underlie much of the Constitution of the United States. The entire display was made in England by the artist Louis Osman and was presented to the United States as a gift from the British government to celebrate the bicentennial of American independence. Magna Carta (Latin for "Great Charter") was sealed by King John of England at Runnymede, near Windsor Castle, on June 15, 1215, after the king was forced by his barons to agree to the charter’s contents. Dissatisfied with the king’s capricious rule, the noblemen had united to limit his powers. Magna Carta forbade arbitrary arrest and imprisonment, established the rights to a fair trial and to security of property, and guaranteed that the nation’s government was itself subject to the same laws as its subjects. In succeeding years, the document provided a written foundation upon which many individual rights and liberties were developed and elaborated. The English colonists who settled in North America were well aware of these rights and liberties, and abuses by King George III finally resulted in the American Declaration of Independence. That document and, later, the Constitution were in many ways influenced by the basic principles of Magna Carta. During June and July of 1215, 13 known copies of Magna Carta were written by hand in Medieval Latin on parchment and distributed throughout England. Only four survive: one at Lincoln Cathedral, one at Salisbury Cathedral, and two in the British Library. The text in the United States Capitol’s Crypt display is that of one of the British Library copies. Because this copy, known as the Wyems copy, is marked with additions and corrections that are incorporated in the text of the other known copies, it is recognized as the earliest extant. The display pedestal in the Crypt of the U.S. Capitol consists of Yorkshire sandstone surmounted by a block of pegmatite, a rare three-billion-year-old volcanic stone from the Outer Hebrides. On this rests a presentation case made of stainless steel in the form of a hinged, flat box clad in gold and white enamel. The gold panel inside the lower section of the case holds raised gold text duplicating that of Magna Carta; gold replicas of King John’s seal are at the left of the document. On the glass center divider are gold incised letters forming the English translation of Magna Carta. The other half of the case holds a gold plate engraved with symbolic designs depicting the sun and the moon, Adam and Eve, a crab with eyes of black pearls, a dragon with emerald eyes, and a dove of peace with sapphire eyes. The small diamonds in the hair of Eve are stars; the pearls are raindrops. Above the dove and between her wings are 50 diamonds, representing the 50 states. The three-dimensional figures assembled over the engraved plate are intended to suggest a 12th-century version of a 13th-century illuminated manuscript. At the base are the four rivers of paradise, from which springs the tree of life. The snake represents evil; the ivy, protection. The apples are the forbidden fruit, and the mistletoe represents family affection and loyalty. The blossoms on the tree branches are the Tudor Rose of England — white flowers for the house of York and red for the house of Lancaster. The combined red and white flowers signify the resolution of conflict. Other symbolic plants include the shamrock for Ireland, thistles for Scotland and daffodils for Wales. The oak, for Britain, grows into the Royal Coat of Arms, with the lion and the unicorn composed of gold and silver and set with precious gems. The entire display was made in England by the artist Louis Osman, who had also crafted the crown for the investiture of Prince Charles. The display was presented to the United States as a gift from the British government to celebrate the bicentennial of American independence. Representatives of the British Parliament and the United States Congress formalized the gift at a ceremony in the Capitol Rotunda on June 3, 1976. 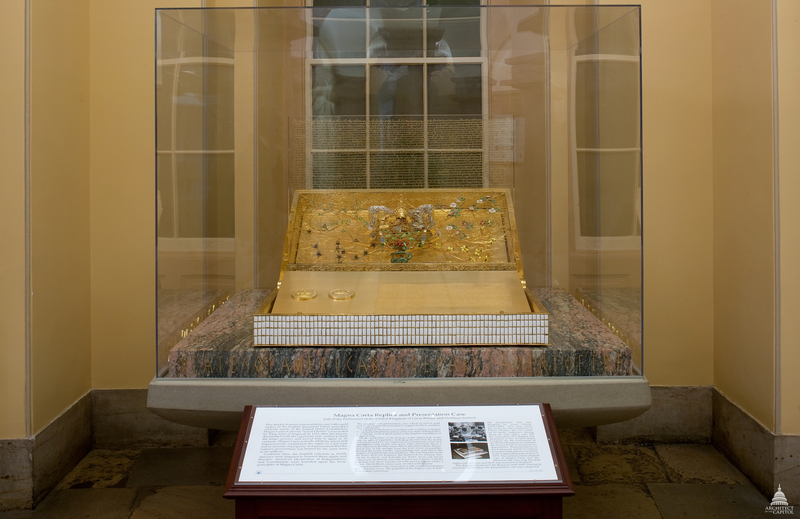 For the next year, the original Wyems copy of Magna Carta was displayed in the case atop the gold replica; it was returned to England on June 13, 1977. The placement of the display in the Rotunda was authorized by concurrent resolution. 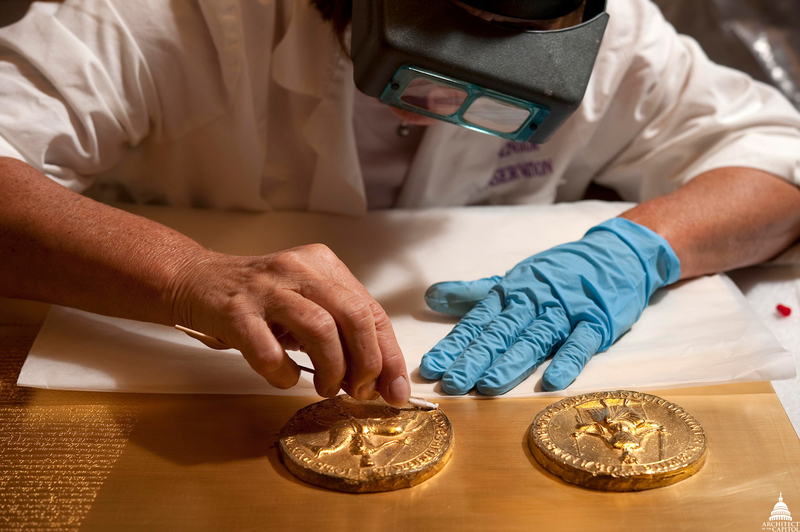 Cleaning the Magna Carta; detail of the two medallions depicting the seal of King John. The display remained in the Rotunda until August 2010, when it was moved to the Crypt. During this relocation, the presentation case was conserved.